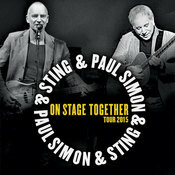 Paul Simon and Sting may sound like a somewhat unlikely pairing - 73 and 63 respectively, they're from opposite sides of the Atlantic, and found fame in different decades with different genres. But more than 40 years on, their musical ideas seem to be easy bedfellows, and sharing their bands and songs as part of their On Stage Together tour brought many wide smiles to Vector Arena last night. As the two stars took to the instrument-laden stage (including three drum kits), there was an enthusiastic curiosity in the crowd, and they were rewarded with the pair sharing the stage for more than a third of the set, duetting, adding solos, and generally having a ball. Both Sting (who was rocking an impressive beard) and Simon (in his signature trilby) have explored many musical cultures in their careers, so there was a dynamic element of experimentation throughout the evening. Their blended 15-piece band added everything from cello to African percussion, French horn, and tuba to the tracks, and songs like 'Mother and Child Reunion' and 'Desert Rose' provided ample opportunity for the instrumentalists to shine. There was a lovely sense of electricity between them as Sting tackled some muscular new harmonies, or delivered an impressively powerful version of America, and Simon added an emotional vulnerability delivering verses in 'Fields of Gold' and 'Fragile'. Their turn-about verses on Simon's 'Boy in the Bubble' set the bar for the evening, and though their collaborative numbers (particularly 'The Boxer') had a special sense of magic, their own solo hits were as invigorating - Sting's 'Message in a Bottle' and 'Roxanne' and Simon's 'Me and Julio Down by the School Yard' and 'You Can Call Me Al' being crowd favourites. It was a night where the whole and the parts added up to one great sum.